Managed all 3 sets of 15 OHS without breaking them, my best before was 13!! Only one more weight vest workout to do. Started college yesterday. Im on the Classroom assistant course - the only guy in the class. 22 women and me! Not at im bothered, as long as I finish the course and get a job I wouldnt care if it was a class of monkeys. Because Im in college all day Wednesday and at work - 9-3 college 5-10 work - I think Wednesday will be a rest day. This big spider ran across my living room floor! 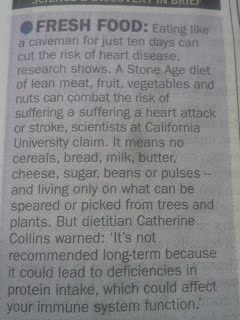 Eating a diet of lean MEAT, fruit, veg and nuts will lead to a deficiencies in protein intake?? 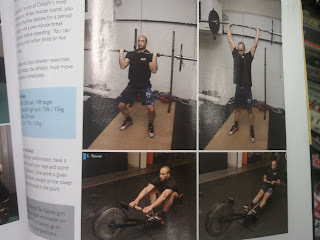 I havent bought a copy of F.O in a while but had a quick glance through it today in Tesco and look who is in it - Leon and Johnny from CrossFit North East England! Have no idea how many rounds I got but that was a great workout, not done bent over rows for years so was interesting to add them into a workout. After this I found a big rock and did a couple of weighted walks for as far as I could till I dropped it. My time for this was 14mins 29secs. 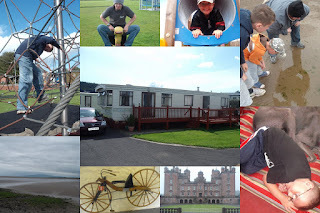 Spent Thusday to Sunday in Ecclefechan at my friends caravan with Jax, the kids and the dog. We had a fantastic time, apart from Friday when it seemed to rain all day. We had a movie day, went to Gretna Green, went to Powfoot which is on the Solway Firth and headed to Drumanrig Castle on the way home. Really enjoyed the time away, will need to do it again soon - maybe at the September weekend. 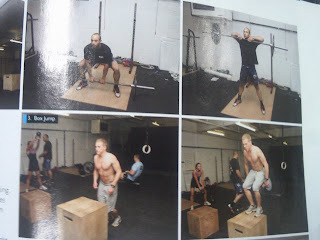 Box jump Fun at Maverick Strength and Conditioning (Fail) from Davie Easton on Vimeo. Some box Jump fun at Maverick Strength and Conditioning from Davie Easton on Vimeo. Did the HSPU without the vest, used it as a depth gauge making sure every rep touched it. Then had a bit of a play around. 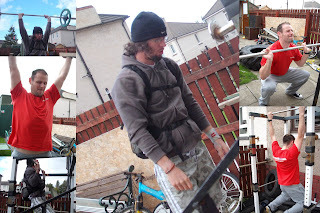 A few snatches with 30kg, 40kg and one with 50kg. Then some BFT jumps. Now, the BFT is 3 tractor tyres stacked on top of each other - I have no idea what height it is ( will get it measured). I had a few attempts yesterday and got my fet up on top but couldn't stand up. Today I managed it but nearly fell off because the top tyre has very soft side walls...but I did it! The next attempt though was a car crash - I jumped, landed too far into the tyre then fell back...onto concrete! Havent weighted in this week, but going by last week that is a couple of kg over body weight! I wil be back to this garden a lot, want to see how it grows and transforms. Tweeked my back a little bit, not sure if it was at Fife on Saturday but haven't trained since then. Going to rest it again today and see how it is tomorrow. I did however get a Hobo lifting platform sorted for the Hobo gym - some marine plywood on top of the wood and rubber tat is already in the gym.